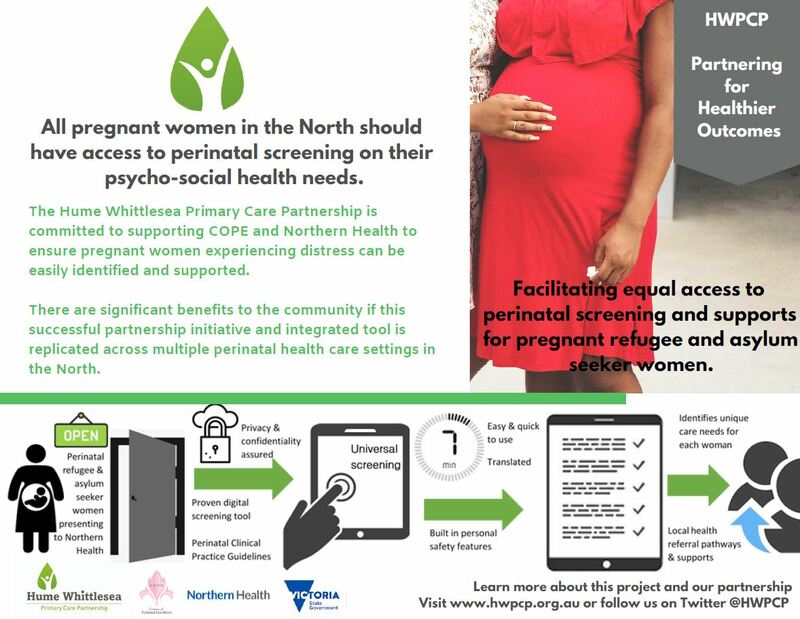 In August 2017, a working party was formed to determine that the role of the iCope Implementation Project Working Group was to oversee, monitor and evaluate the implementation of the iCope Digital Screening Platform for vulnerable women across the Shared Vision for the Growing North’s catchment area. This group identified that there would be five phases for a complete roll out of the screening platform across the northern region. Phase 1 was the roll out of the iCope Perinatal Screening platform into the community sector. This project was a partnership between Dianella Health, Plenty Valley Community Health, Hume City Council Maternity and Child Health and COPE. Phase 2 is the implementation of the program into Northern Health. Without the participation of Northern Health, the validity and success of the program in the northern region of Melbourne would be limited. Phase 3 is the development of an audio-based digital platform. Service Agreement: Service has been agreed and signed by COPE, Northern Health and Hume Whittlesea Primary Care Partnership. The Screening tool and administration console has been amended to suit Northern Health work practices. 15 iPads have been purchased and are currently being configured by Northern Health I/T Department.